What if you could achieve these advanced effects in Divi with just a few clicks? What if you could make these changes easily in your Theme Customizer? Think of all the time you would save! And how much more awesome your website could be – with just a few clicks! Divi Toolbox makes it possible. Say goodbye to wasting time and getting frustrated with your website. 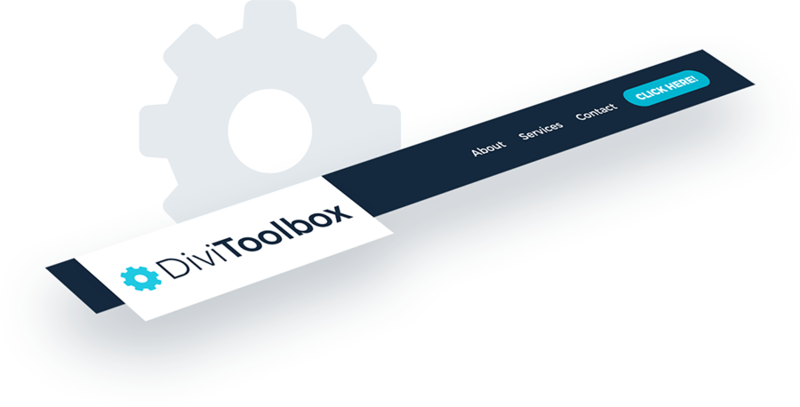 Say hello to Divi Toolbox! When you want to achieve an advanced effect in Divi, you often have to use custom CSS. And to do that, you either have to experiment with strings of code or look for tutorials. It takes time. The Divi Toolbox will help you achieve many advanced effects with just a few clicks! Leave behind the limitations set by Divi. With the Toolbox, you’ll be able to create fantastic effects in minutes, no sweat! Now, every website you build will stand out from the crowd. Creating impressive websites has never been so easy! 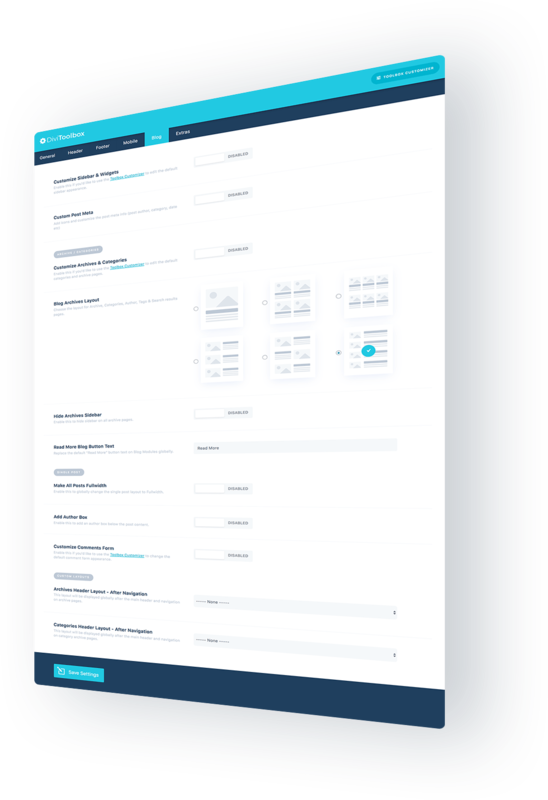 The Divi Toolbox lets you pick the elements you wish to change. 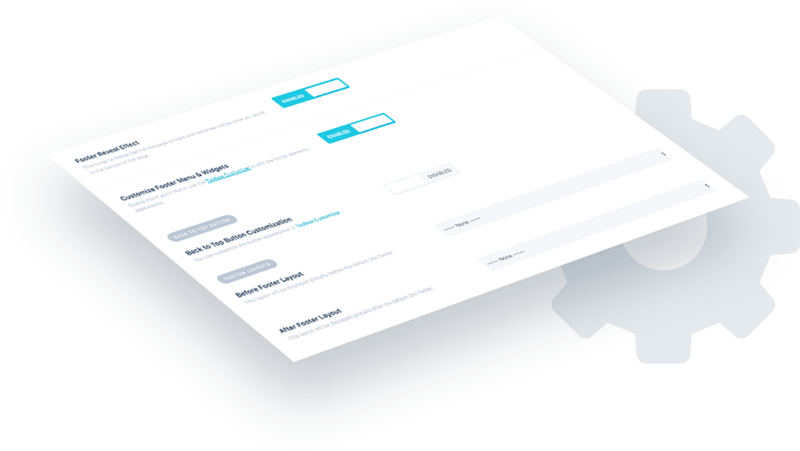 When you enable a feature, it appears in your Theme Customizer, where you can make adjustments and site-wide enhancements with just a few clicks. You can even change global heading font styles! This plugin is a real time-saver and it adds hundreds of options to the Divi Theme Customizer! You can modify your logo and header with ease. Create a custom dropdown menu, add a CTA menu item, or make your menu more interactive by adding hover effects. You can also change your logo on a fixed header, create an overlapping logo effect, and display any layout from your Divi library before and after header. Each of these changes is further customizable right in your Theme Customizer! Create the best mobile experience by adjusting your mobile menu! 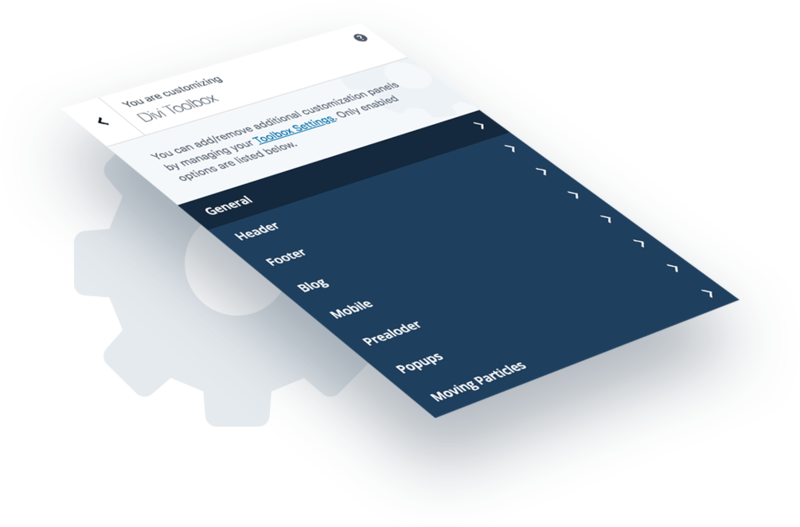 With this set of new settings, you can make the mobile menu bar fixed, enable slide-in mobile menu, add hamburger icon animations, collapse nested submenus, and change your logo for mobile menu! These are the main features, and each of them comes with more of its own customization options. Are you bored with the default Divi blog layout? With the Toolbox, you can change it in minutes! The Divi Toolbox has six (!) custom layouts for your blog categories and archive pages. You can further customize each element in your chosen layout. You can also customize you single post page by adding an author box, related posts, and the previous/next post navigation to hold your visitors’ interest for longer. Even more: you can add custom header layouts on archives, and globally customize or hide the sidebar. Create the best blogging experience on your website! With the Divi Toolbox, you can style your footer without using CSS or looking up tutorials! You can customize the widgets and footer menu, add more social icons – and style them! The Toolbox makes it possible to quickly enable sticky footer or footer reveal effect, and customize the back to top button. Another option is to add custom Divi layouts before and after footer – globally. You’re just a few clicks away from making your footer amazing! Maybe you’ve always wanted to have a fancy preloader but it seemed like too much hassle? Now you can have it! The Divi Toolbox can also enable custom popups, which display any layout from the Divi Library. You can easily add moving particles background, or 3d tilt effect! Get the awesome effects you have always wanted! The Divi community has already fallen in love with the Divi Toolbox! Read our customers’ testimonials to find out what they think. The first time I used Ania’s plugin “Divi Toolbox” I knew I would be adding it to every site I built as it made my workflow so much faster. The plugin itself is simple and intuitive to use, and it has loads of useful features that make each site unique in no time at all. Thanks, Ania for taking some of the work out web development. Ania has accustomed us to amazing products with her child themes, this time she delivers the same quality in the form of a plugin. Divi Toolbox is an easy to use plugin that adds many different functions to a variety of the Divi native features, that will be appreciated both by beginners, and also intermediate users, who wish to save time and also add multiple design elements to their site; set the h1-h6 settings, different blog page layouts, fun css & jQuery interactions, parallax elements, etc. The great thing is that many features will continuously be added. I highly recommend this plugin to any Divi user for its simplicity and efficiency. 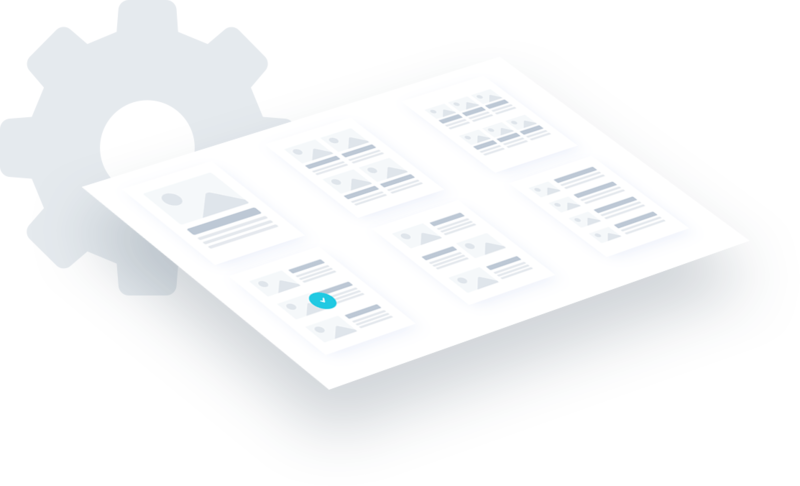 With Divi Toolbox, you have the ability to customize the most important features in Divi without the headache of trying to custom code everything with CSS and PHP. Area’s like the Divi header, footer, blog layouts, post pages and other global site settings are seamlessly customized right in the Theme Customizer. 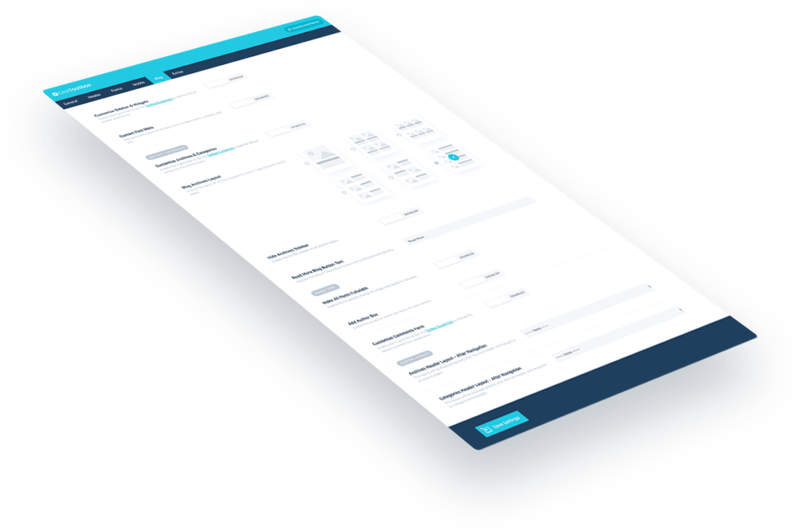 It’s intuitive, easy to set up, easy to use and you can see your changes live which makes it a fun, interactive experience. If you don’t want to have to custom code, this plugin is a must! And even for advanced coders, this plugin will save you hours when designing custom websites in Divi. Streamlined, intuitive, powerful… Beautiful UI, awesome experience! I really have to mention that I could save several plugins by using Divi Toolbox alone. You have to check the plugin functionalities for customization on header, logo, menu, mobile, footer, blog, modules, layouts. It is impossible to put all the features together in a few lines. I’m in love with this plugin. I mean it! One of the most useful tools for Divi! Watch the Divi Toolbox in Action! See how easy it is to enable and customize advanced effects in Divi! The only thing you need is the Divi Toolbox. Can Divi beginners use it with success? We are happy to say that the Divi Toolbox has been tested by Divi newbies! They found it super easy to work with. The plugin’s interface is simple and intuitive, and each feature is briefly explained using simple terms. Can I use it with Extra Theme or Divi Builder plugin? No, sorry. This plugin is build to work with Divi Theme specifically. Does it work with the Visual Builder? Divi Toolbox has limited support for the Visual Builder. Custom layouts in header and footer can be edited with VB in the Divi Library but won’t be accessible while editing a page. Some of the custom effects like 3D Tilt, Modules Parallax or Particles Background won’t be visible in VB as well. Do I need a child theme to use the Divi Toolbox? No, you don’t have to use a Child Theme, but you can if you want to. If you’re planning to add more advanced customizations or edit template files – then yes, it is advisable that you use a child theme. Will you be adding new features in the future? YES! We’re already working on several new options to edit WooCommerce elements, and if you have a feature request – feel free to get in touch and we’ll do our best to help! What if I’m already using custom CSS on my site? Divi Toolbox is best used on a website from the very beginning. You’ll see there might not be a need to add any custom CSS (just like we didn’t add any on this very website!). If you already do have custom CSS, it may interfere with the Toolbox settings. Divi Toolbox doesn’t load all the options if you’re not using them. It loads just a single JS and CSS file with the code customizations that you decided to use. Enabling custom effects like Moving Particles, Parallax Scroll and 3D Tilt will load additional JS file. I have other questions, where can I get support? To get support after the purchase, log in to your account on the Divi Lover or B3 Multimedia website and submit a support ticket. If you have a pre-sale question please use this contact form.